First of all, if you came here expecting the eloquent and witty writing of my beautiful wife, let me apologize now. A couple of days ago I decided it would be a good idea... an extremely romantic idea... to takeover my wife's blog for Valentine's Day. I guess I'll find out soon enough just how amorous my idea really was. For those of you who are new around here, my name is Brandon, often referred to as just B. Laura and I have been married for 7 years and I would not change a single day. If you have not read our story, I would highly encourage you to do that at some point. It will really help you to understand all we have been through and why our love for each other grows deeper and stronger everyday. 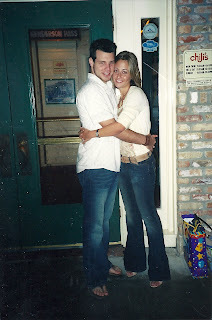 Chili's.. our "go to date"
When I think about my wife, I am overwhelmed with thoughts of true beauty. She is not only the most beautiful girl I have ever laid eyes on, she has a heart for God and people that I have never seen before in anyone. She is real.. She is so genuine.. She is exactly who she says she is. She doesn't have to convince me, she simply lives it out in front of me. She has more wisdom than she even knows. She sees the best in every situation. She is so talented and communicates the little moments of life so well. I really could not have asked God for a better women to spend my life with and everyday I am so amazed and thankful that He blessed me with her. I love you! You have been a true example of what a wife should be. There is no better Mom on the earth for our kids. You have been all that I prayed for and everything I didn't know I needed. I am so excited each and every morning I wake up next to you because I know I have the honor and privelege of being called your husband. You love me beyond my wildest expectations and I know that there is no better place to be than right where I am. Happy Valentine's Day to you... the most beautiful girl in the world! This was the most beautiful gift you could have ever given your wife!!! 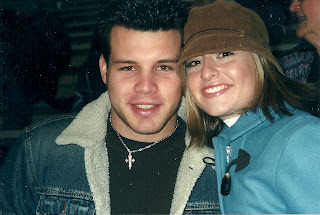 Happy Valentine's Day to both of you and may God continue to bless you in your love together!! B is so sweet. Happy Valentines Day Laura. What a wonderful things to do for your wife! So sweet. What a special way to show your love and appreciation for your wife on valentines day!! I bet she LOVED this! Way to go Brandon! umm how precious was this! So sweet! I'm always so blessed by marriages that have God as the center and are such an example to others. You guys rock!